Ginger root tea is a light golden color, and the taste is spicy, hot, and sweet. The fresh root makes a slightly sweet tea, dried ginger is slightly hotter and drier. 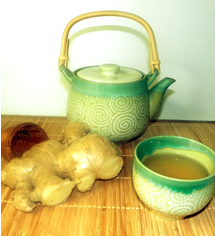 Ginger is one of my favorite teas, as a single ingredient and as an addition to other herbal blends. You should drink ginger tea daily for a healthy tonic. Grate or thinly slice ginger. Use a generous teaspoon of ginger for each cup of water. Add to cold water and bring to a boil over medium heat in a covered saucepan. Gently simmer for 10 minutes. Turn off heat and steep until cool enough to drink. Alternatively, you can prepare fresh ginger as an infusion for a lighter taste. Drink 1-3 cups of ginger tea daily. Adding just a touch of honey brings out the spicy flavor, and protects the stomach.